Pollution: Treating Environmental Toxins is a fascinating overview of environmental medicine, an interdisciplinary field including physiology, chemistry, and environmental science, and its development into an important area within human and veterinary medicine. The book looks at how pollution has become pervasive-few places are left where people or animals can live without being exposed to pollution-and how toxic substances travel through the air and fall, for example, onto growing crops or open bodies of water. 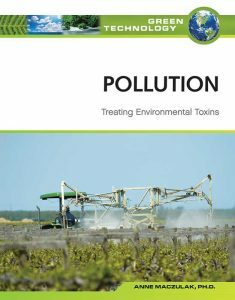 Sidebars, figures, and case studies enhance fundamental concepts and give the reader a sense of the urgency of the issues related to toxic substances and their impact on the environment. The book contains more than 50 color photographs and line illustrations, five appendixes, a glossary, a detailed list of print and Internet resources, and an index. Green Technology is essential for high school students, teachers, and general readers who seek information on the important issues that affect the environment worldwide.